No matter who you are, if you are a baseball fan, you have opinions on how to make the game better. It could be ways to speed up the game, a way to play the game more effectively or even personnel decisions that would alter the complexion of your team. Regardless of what your ideas are, more than likely they will fall on deaf ears. Now if you are a baseball lifer like today’s author, you automatically gain some credence to your ideas just because of the experience and respect you have attained during your career. Buck Martinez has been a solid baseball lifer. Spending a career as an on field back up Catcher, he had the opportunity to study the game during his three team stop in the major leagues. His final stop in Toronto seemed to provide him the best education and allow him to find as permanent a home as one can find in baseball. His post retirement career as both field manager and television analyst have continued his baseball education and allowed him to become one of the most respected minds in baseball. This book has almost a Frankenstein feel to it. It really could have been several different stand alone books all by the same author, but here it is rolled all in to one product. The first part of the book that Buck gives the reader, is his childhood and playing career. You see his love of the game from his youth and how he worked himself hard to become a major leaguer. He was for most of his time in the major leagues a back up or fringe player which allowed him to study the game. All three teams, The Royals, Brewers and Blue Jays, were all fairly bad teams that were attempting to build a quality product on the field and Buck was part of the construction of all three. It was those three stops that Buck learned what it took to be a winner and how to build success. After his playing days were over Buck found a home as an analyst for the Blue Jays and has made himself a vital part of the Jays TV crew and a respected voice from the booth. His analyst career was interrupted by a brief and not so successful stint as Blue Jays manager. It was a wrong place, wrong time career move, that if it was under a different set of circumstances, may have turned out much different. The third part of this book conglomeration is Buck’s opinions of what works and does not work within today’s game. He cites examples of who he thinks is playing and respecting the game at the correct level. He also presents some ideas that he thinks would improve the game. He has some decent ideas that someone within the game and the powers that be, may want to stop and take a look at. They are not way out ideas and would help enhance the game as we know it today. When you think of Buck Martinez you don’t think of a Hall of Fame player. While he had an average career, he has made himself a spectacular student of the game and makes educated and well thought out suggestions to improve the game. If you are looking for an educated view of the current game this may be a book you would want to check out. He presents his ideas in ways that would improve the game without disrupting its natural flow. The book showed a whole new side of Buck Martinez to me and allowed me to gain a whole new respect for him. Canada-No Longer a Vast Wasteland for Baseball Books !!! Canada has always in my opinion, been an overlooked area when we read about baseball. I realize it really only came into play in the last 45 years or so, but I never thought it got the attention it deserved. In reality over the last 50 years it has created two strong teams, introduced Canadian fans to the game and to some degree cut into the Hockey monopoly in Canada. With talk of the Rays possibly packing up and moving to Montreal, I thought now would be a good time to see what books are available for the teams north of the border. To me it feels like the Expos didn’t exist. Maybe its a matter of nobody remembers that they were even there or that nobody wants to remember. But whatever the case may be they did exist at one point. During that existence they had a span of years where they were always at the top of the standings fighting for the division crown. The years from 1977-84 were really the defining years of the franchise. They had a steady parade of Hall of Famers on the roster but could never quite get over the hump to glory. When you have names like Gary Carter, Andre Dawson, Pete Rose, Tony Perez and countless other stars like Rusty Staub, Ellis Valentine and Warren Cromartie, you would think they would be able to pull it off a few times during those years. 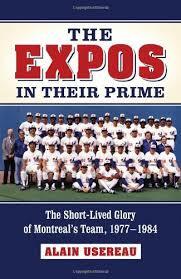 Obviously they did not, but Alain Usereau has taken a deep, hard look at the Expos during their glory years. You get some behind the scenes look at the way the team operated on and off the field, both as a group and individually. You see the mind-set of the front office and why they made some of the moves they did during those years. The reader also gets a look at what the team meant to the fans of Montreal. This book proved to me that Montreal is still today, a viable option for a MLB team as the fans would support it there. Perhaps it was the poor product on the field in the final years of the Expos that contributed to poor fan support. It seems that in Montreal if you build it, they will come……if it’s a decent product. This book gives a lot of insight to an often forgotten team with limited success. It’s overall a good book, that most baseball fans should enjoy. I only mention this next thing because it is a pet-peeve of mine. It would have benefitted from a little better copy editing because their were to many grammatical errors for my liking in a finished book. But as I said its a good book that most fans will enjoy. Lets look at the other side of the coin in Canada, the Toronto Blue Jays. Since their inception they have had good fan support and produced some serious thrills for their fans. A few division titles, and oh yeah, two World Series Championships, which make for a happy fan base. While the Blue Jays had their growing pains in the beginning, they seemed to stumble upon a better plan for on-field success that the Expos could never quite attain. But what happens in Toronto when the team and the fans have huge expectations and it blows up in their faces? For all intents and purposes, 2013 was supposed to be the Toronto Blue Jays year. Much like the Chicago Cubs have done this off-season, the Blue Jays blew up the roster and started over. The looked at weaknesses at every position and went out and brought in some of the best names in the game to fix their problems. On paper the Blue Jays looked like the team to beat and at the start of the 2013 season other teams noticed. But as the saying goes, the road to hell is paved with good intentions, the 2013 was a flat-out train wreck. Injuries, career declines and pretty much the fact that anything that could go wrong……did go wrong, the Blue Jays had a dismal year. Davidi and Lott take the reader on a journey through the 2013 season. They look at the blockbuster trades that were made in the off-season, free agent signings, spring training and of course the season. They give a nice look at the operations side of the Toronto front office and how the fans had embraced the new hope in Toronto. It also shows the mindset of the GM and what management felt they were accomplishing by assembling this team on the field. 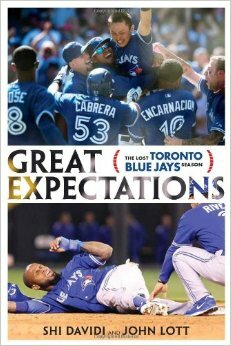 The book gives a detailed look at how the season in Toronto, and in the end the fans turned on the team and the front office. It is a great look at how the Blue Jays and its fan base operate and feed off of each other. The 2014 season was a little better than 2013, and probably the residue of this 2013 team will achieve the initial success they expected eventually. But I think much like the Expos, the Blue Jays are often an afterthought to fans outside of Toronto. But it is nice to see that books are coming forth that show the Canadian pride in their teams and most of the time they are just as good if not better than the other teams out there. Just because most of the country is hockey crazy does not mean that they have forgotten how to love baseball. Life is a Hit; Don’t Strike Out! Before I read this book I had what I thought was a pretty accurate opinion of Al Oliver. As a player, I felt he was often overlooked in terms of the quality of his play and his final career numbers. As a person I felt he came off as a grumpy guy. The personality take was based on the very limited media exposure I saw of him when he played for the Phillies briefly near the end of his career in 1984. He just came off as a guy who wasn’t very friendly when interviewed. After reading todays book it looks like I was wrong about Ol’ Scoop. This book pleasantly surprised me. 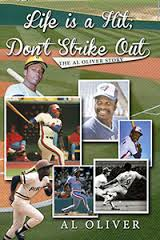 Al Oliver really delivered with a pleasant account of his life, career and faith. He goes into great detail giving you the inside “scoop” on his childhood, friends and family life. You get an honest glimpse of the man himself outside of baseball. He is like any other human being on this earth with family issues. He does not hide from any of the issues (good or bad) and shows how his faith has made him a better person and guided him through these issues. As far as the man himself goes, this book has improved my personal perception of Al Oliver. He really wasn’t the grump that came across on the TV screen. He was just very intense and a somewhat private person. On the career side of things I always knew Al Oliver was a good player. I just never realized how good. The book has several detailed pages of his hitting and fielding stats. Which leads me to my next question, why has he been overlooked so long for the Hall of Fame? With the types of numbers Oliver put up during his career, which are better than some of the others that have already made the Hall during his era, it makes me wonder why. Al Oliver also I think has the same questions in the book, but it is not a bitter former player asking why. He has said several times in the book if it is God’s will then it will be. Which is a great attitude and belief to have if you are in his position. It again shows his strength in his own faith. Getting back to the question of why hasn’t Al Oliver made the Hall of Fame. I have no idea personally as to why. The man’s numbers speak for themself. With career numbers like this, he belongs in the Hall. Which now leads to another sticky topic of the Hall of Fame being a popularity contest with the writers. Perhaps several of the writers that would have voted for Al, got the same impression of him that I had previously. Perhaps some of those writers should read this book and get perspective on who the man actually is. Perhaps it would put some long-held grudges to rest. or direct from Al oliver at http://www.al-oliver.com where I think you can get a signed copy.